President Barack Obama reportedly rejected advice from Gen. Lloyd Austin, commander of U.S. Central Command (CENTCOM), to send a limited number of combat troops to the Middle East to assist in the fight against ISIS. According to Dustin Walker of RealClearDefense, Obama refused the “best military advice,” which was “to send a modest contingent of American troops, principally Special Operations forces” in an advisory role. 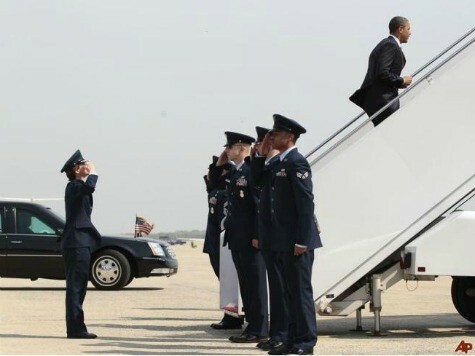 It was not the first time that President Obama has rejected the military’s advice. In fact, every major military action of the Obama administration has been undertaken contrary to the guidance of senior military leaders. In Afghanistan, generals wanted more troops than Obama committed to the “surge”; in Libya, the Chairman of the Joint Chiefs of Staff opposed military involvement; and in Iraq, the military wanted to retain a residual force. In each of these cases, the military’s advice and/or reservations have generally proved correct. Afghanistan has been a long retreat due to insufficient military commitment and the declaration of a withdrawal timeline for political, not military, reasons. In Libya, victory came quickly but the country has fallen to Islamists in the aftermath. And Obama’s hasty, complete withdrawal from Iraq created favorable conditions for the rise of ISIS. Obama’s reasons for wishing to avoid putting “boots on the ground” in Iraq are clear. One is that the public is against sending combat troops, though it favors action of some kind. Another is that he does not want to be seen as having launched a war, lest he be likened to his predecessor. And another is that he does not want to ask Congress for approval–though he likely must, anyway. None of these reasons relates to military success.